We’ve had a few Cat phones at the office to test out, and for sheer ruggedness they are hard to beat. A new one has now hit the shops with the Cat S61 available locally. Much like its predecessor, the S60 (which we really liked), the S61 is also IP68 & IP69 rated, dustproof, built to withstand steam and high water pressure, and waterproof up to three metres for one hour. Again it features the enhanced FLIR thermal imaging camera, able to pick up heat spikes to help locate and diagnose damp, draft, leak, short or blockage. Photos of this can be taken and shared with clients or colleagues. Onboard this time around is a laser assisted distance measure. Cat believes it’s accurate up to eight meters, and can be used to measure the distance from the device to a surface, and to estimate areas on that same surface. This will help measure materials needed for painting, flooring or tiling, all from the Measure app on the device. Another feature onboard that could come in handy in very specific circumstances, is the Indoor Air Quality Monitor. The company notes it is capable of measuring Volatile Organic Compounds (VOCs), prompting one to open a window or grab some fresh air if an unhealthy level of VOCs has been detected. Common sources of VOC’s include paints, solvents, carpets, furniture and cleaning products, making it useful when painting rooms or laying carpets. This monitor can also be used to provide temperature and humidity readings. It’s useful for example, in rooms without an extractor fan or to indicate when a freshly plastered wall is dry and ready to paint. Running through the S61 specifications, you’ll find a Qualcomm Snapdragon 630 octa-core 2.2 GHz chipset, 4 GB RAM and a decent 64 GB of storage space (expandable with a microSD card). Screensize stands at 5.2”, while the display is Full HD with enhanced brightness, made from Gorilla Glass 5. At 250 g it’s certainly not the lightest handset on the market, nor the slimmest, coming in at 163x78x13 mm. 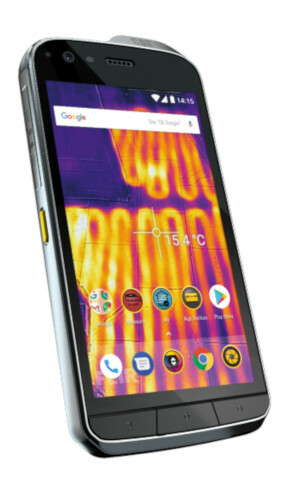 For more info or sales of the Cat S61 smartphone can be found here, while it will cost you R15 999. It is also on sale at the cellular providers.